New professor at Center for Permafrost at Department of Geosciences and Natural Resource Management is about to take part in quantifying and predicting the consequences of environmental and climate changes in the Arctic. Per Ambus. Photo: Kent Pørksen. For press photo, click the photo. 1 December 2014 Per Ambus will commence as professor in arctic isotope geochemistry at Center for Permafrost (CENPERM) at Department of Geosciences and Natural Resource Management at University of Copenhagen. By means of stabile isotope analyses, he will take part in providing a scientific breeding ground for quantification and prediction of the consequences of environmental and climate changes in the Arctic. “The objective of my research will be to link knowledge about the biogeochemical processes with the hydrological conditions by using and extending analyses of stabile isotopes in soil, water and air,” Per Ambus says. Per Ambus is a pioneer in research of soil green house gases and has for a number of years been a front-runner in developing methods and applications of stable isotope analysis as research tool in soil and atmosphere. Methods that can be applied in order to explore and document how biological and geochemical processes in landscapes, and the conditions in the atmosphere and the surrounding environment can be connected. Per Ambus will teach at the Geography study program at University of Copenhagen in the course “Soil resources and environmental geochemistry”, and will develop a future course on application of stabile isotope analyses to investigate landscape bio-geochemistry. Per Ambus holds a Ph.D. from the former Department of Population Biology at University of Copenhagen and was employed as scientist at the former Risø National Laboratory. During the last three years he has been employed as professor at Department of Chemical and Biochemical Engineering at Technical University of Denmark where he among other things has been the head of Center for Ecosystems and Environmental Sustainability. Per Ambus will give an inaugural lecture Thursday 4 December in Auditorium B at 14:15 at Center for Permafrost (CENPERM), Øster Voldgade 10, 1350 København K with a subsequent reception in Rød Stue. CENPERM is a center of fundamental research financed by the Danish National Research Foundation which focuses on the correlation between soil, microorganisms and plants in a future climate in the Arctic. One of the main focuses for CENPERM is the application of isotope geochemistry. 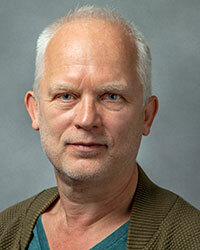 With the hiring of Per Ambus a new professorship is established and CENPERM’s work is further strengthened.